Reservations and availability inquiries can be made by using our contact form. Sorry, we don't currently have any puppies of this breed available. 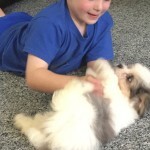 Please browse our other puppies, and keep an eye on this website for future litters. You are welcome to contact us for more information.